It’s June. In the Pacific Northwest, temperatures are finally rising, the days are long, and the rabbitry is in full swing. What does this mean to a breeder of livestock rabbits? We don’t know a single rabbit breeder that likes to butcher their rabbits. Every one of us develops strong affection for every animal in the herd, yet we recognize the role of rabbits in the ecosystem and the value and legitimacy, even the need, for humans to eat animal protein for optimal health. Shows and camaraderie. It is through rabbit shows that breeders gain insight into the nuances of improving their stock. And at rabbit shows, everyone knows that those scratches up and down your arms were neither attempts to do yourself bodily harm nor the result of poor animal husbandry! Speaking of livestock rabbits, Raising-Rabbits now helps rabbit breeders save $$ on all sorts of rabbit housing. 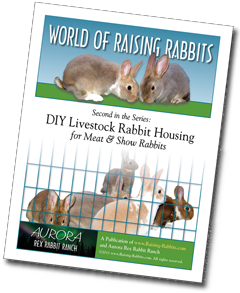 If you raise meat or show rabbits, the housing ideas in this ebook are especially valuable. Visit Rabbit Hutch Building Plans for the whole scoop on DIY Livestock Rabbit Housing. With 89 pages and 15 chapters, DIY Livestock Rabbit Housing offers even more resources than our first ebook for pet owners - Pet Rabbit Living Spaces. We again decided to keep the price at rock bottom for the sake of our fellow rabbit breeders. Our low introductory price is just $6.49, which will expire on June 15th. Even at the regular price of $7.49, you’ll save double, triple, or quadruple the cost of the e-book with every single project you build. Hurry over and purchase your copy today! PS: Yes, we'll soon offer BOTH volumes for one low price. Watch www.raising-rabbits.com for the announcement. This last story is very interesting, since we’ve helped chefs looking for fresh meat rabbits. If we ever get up to Edmonton, we’ll definitely check out "Packrat Louie's!" Coccidiosis is a health and profit robber named Eimeria steidae. How do we know? Because we’ve recently encountered the very first instances of this parasite in our barn. Coccidiosis comes in two forms - intestinal and hepatic (liver). But even in the liver form of the disease, the intestines become gassy and bloated. Both forms can result in diarrhea, loss of condition and death. The parasite is passed in the manure, and therefore spreads through contact with droppings. Our first clue, though we didn’t know it at the time, was some loose stools and failure in a few rabbits to attain their full adult weight. And then we butchered a batch of meat rabbits and found a couple spotted livers - not good! We took one liver to our rabbit vet for a diagnosis. Yep, coccidiosis. She said there’d been an outbreak recently in a shelter in our area. What we think really happened is that the shelter rabbits were sick when they arrived, and that a couple of our rabbits picked up the parasite at a rabbit show, where all rabbits cycle past the show table and may come into contact with the droppings of other rabbits. Albon(R) (sulfadimethoxone) has been the treatment of choice for years. This is a coccidiostat - it inhibits the ability of Eimeria steidae to reproduce, thereby giving the rabbit’s own immune system an opportunity to wipe out the infection. But for quite a few more pennies, there’s a new kid on the block. Ponazuril, or the related Toltrazuril, are said to actually kill the parasite within 1-5 days. The vet remarked that it is possible to breed for resistance to coccidiosis. Breed for resistance? We can do that! We already breed successfully for resistance to pasteurellosis. In the meantime, we’re treating the herd. 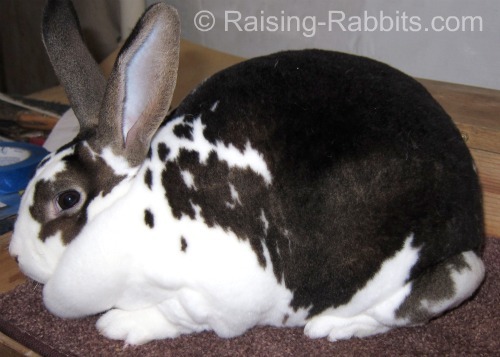 Visit Rabbit Diarrhea for more info on (and picture of) Coccidiosis. 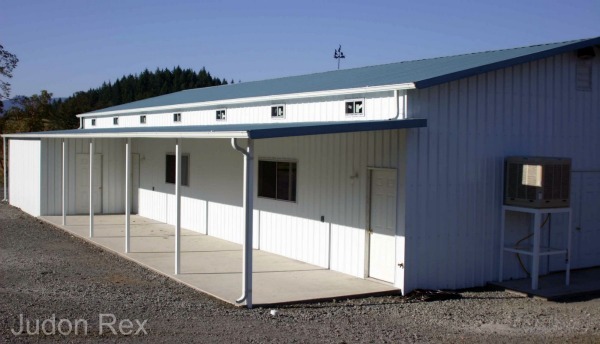 This is the rabbit barn of Don and Judy Atchison of Oregon, world-class breeders of both standard Rex and Mini Rex rabbits. Via pictures, they will give you a tour of their barn in DIY Livestock Rabbit Housing. You'll see some great ways to enhance the environment for livestock rabbits, with or without the lovely barn. Your friends at Raising-Rabbits.com wish you a wonderful June.